Whether you’re looking for Tampa Bay, Clearwater or St. Petersburg Fishing Charters, YACHTFISH has you covered for inshore and deep-sea fishing options. You’ll find snook, redfish, trout, mackerel, snapper, flounder, cobia, tarpon, tuna, amberjack, grouper, kingfish, wahoo, mahi and more. 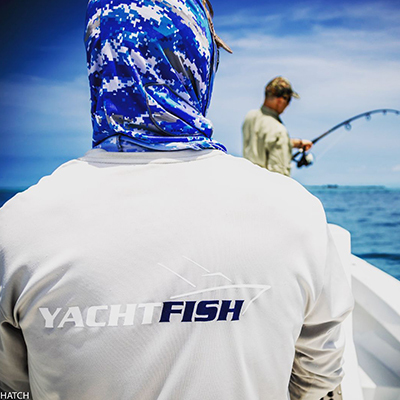 With over 25 years of experience and the equipment to get you on the fish fast, your YACHTFISH team guarantees an incredible experience and fish every time. We are St Petersburg's TOP RATED Fishing Charter! Captain Matt and team are top notch. They put us on fish all day.Great day on the water. Best fishing trip ever! We went out with Captain Garrett McFall out of St. Pete FL and had a great time. Our two sons (8 and 9) caught lots of fish and learned a ton about the bay.Don't hesitate to book with Yachtfish, you will have a Blast! What an amazing day out deep sea fishing in St. Petersburg with YACHTFISH Fishing Charters! 6 of us enjoyed the day catching our limit in Snapper. We also caught a variety of other fish, including but not limited to Gag Grouper, Cobia, Black Fin Tuna, and Red Grouper. Captain Matt and his mate Gavon were spot on with everything the whole day, they had every angle covered. They quickly put us on the fish and kept us on them all day long, I've never seen anything like it.The boat (a 33' Invincible) and all the equipment were in immaculate condition and noticeably very well maintained. Seeing that I'm fairly new to deep sea fishing, I had a lot of questions to ask throughout the day as I tried to soak in as much knowledge as possible (imagine Macaulay Culkin in Home Alone). Both Gavon and Matt were very patient with me and the two kids in our group, I was probably more difficult than the kids in reality.After our jam-packed day of fishing, we had the pleasure of going over to Frescos which is within walking distance of YACHTFISH's Slip. While we were enjoying some of the Snapper and Grouper that we caught, which was cooked to perfection by the Frescos kitchen, YACHTFISH cleaned and bagged all our fish for us to fill our freezers with. They even took the time to separate the varieties for us which made it easy dividing it all up.This was truly the best fishing charter experience I have ever had in my life. We can't wait to do it again!! !Thank you VERY much Captain Matt & Gavon, you guys rock! WOW! What a day! I am a FLNative, but Matt taught me in 4 hours than I thought I knew for 40 years! Super patient w/all my questions and then we caught several snook within the trip. If u get a chance to book YACHTFISH do it immediately, you definitely won’t be disappointed! I am a local fisherman and went out with Yachtfish this past Sunday. We had a heck of a day and caught Mackerel, Snook and a Monster Redfish (39 inches) . The guides were extremely knowledgeable and put us on fish all afternoon.I highly recommend using Yachtfish for your charter needs. We had a amazing time today fishing with Captain Garett! We caught red snapper, trout and sheepshead to take home and a bunch of other fish that was fun to catch. Garrett was knowledgeable about the fish and waters. We took my my 82 father out on the water and he had a blast. The boat is perfect! Captain Matt booked my excursion and followed up with me every step of the way. We’re fromMichigan and we will be back to book another trip out to the Gulf. Thank you Yacht Fish for making our fishing trip a great memory! Highly recommend. Capt. Matt was excellent. He was patient with myself as a new fisherman, energetic, and very knowledgeable about his fishing spots!My wife, son, and I were impressed with his friendliness, ability to take us to several very active fishing spots, and his real sense of customer service. His boat was immaculately clean, as was he and his assistant. They didn't use foul language, drink, or in any other way act as "old fishermen" may tend to be regarded.Without a doubt, it was a great experience and well worth the money. I would recommend Yachtfish to anyone from the novice to the experienced. I garenteed you will enjoy yourself, and learn a lot. My nephew and his fiancé came down for a long weekend and had booked fishing trip with Captain Matt. It was my first experience, my nephew had done this before somewhere else. We had a fabulous time caught snook and trout, tried for tarpon but no luck. The entire day was a great experience. All three of us can't wait to go back. Captain Matt and his mate Garret were so helpful and attentive to our experience. If we had questions they were so willing answer and help. Will definitely go again and share with friends and highly recommend.Colleen Farmer. YACHTFISH Fishing Charters is perfectly located at the downtown St. Petersburg Municipal Marina, which is smack dab in the middle of the Tampa Bay area on the west coast of Florida. No matter which direction you take from the marina for your private inshore or deep-sea fishing charter, you’ll be surrounded by some of the top fishing spots in Florida and great scenery. When you leave the marina, you will have a chance to see the famous Sunshine Skyway Bridge, Fort Desoto Park, Weedon Island Preserve and Egmont Key. If you’re lucky, you will also enjoy the pods of dolphin, manatees and other wildlife indigenous to the area. As a bonus, you will be able to visit some of the famous landmarks and attractions from your pick-up point at the marina. The new St. Petersburg Pier, Straub Park, Dali Museum, Museum of Fine Arts, St. Petersburg Museum of History and the Vinoy Hotel & Vinoy Park are within sight and walking distance. The waterfront is full of shops, galleries, bars and restaurants. Fresco’s Waterfront Bistro is right next to YACHTFISH in the marina and caters to YACHTFISH Guests by cooking their catch and providing a relaxing waterside venue after a successful day fishing. If you’re in the mood for more fun before or after your Tampa Bay fishing charter, try an excursion to The Seminole Hard Rock Hotel and Casino in Tampa for a little excitement. If beautiful beaches are more your style, Clearwater beach and St. Pete beach are consistently ranked as two of the top-rated beaches in the country. The popular TradeWinds Island Grand Resort and legendary Don CeSar Hotel, both located on the soft white sands of award-winning St. Pete Beach, are only 10-15 minutes from the Marina. Tampa International Airport and the St. Pete-Clearwater International Airport are minutes away and serve the area with ease of access and excellent travel options. If you live in, or are visiting the Tampa, St. Petersburg or Clearwater area, you’ve come to the right place for the best fishing charters near you. YACHTFISH is the top-rated fishing charter company in the area with a fleet of boats to meet any angler’s demands and the reviews to prove it. With quick access to Tampa Bay and the Gulf of Mexico, you will put plenty of fish in the boat every time. We guarantee it!